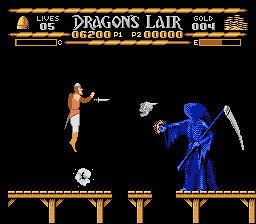 NES Dragon's Lair (JPN) in 05:17.52 by Walker Boh. The Japanese version of this game is not as "watch the grass grow faster than you walk" slow as the USA version. Walker Boh's time for the USA version was about 9 minutes, and Morimoto's time for the Japanese version was about 8 minutes. Here we have an approximately 5 minute movie of this game. This game has very smooth animation and the characters, including the last boss, look somewhat funny, despite the theme of the game.